Have you ever wondered how some of the creatures in this incredibly-diverse world of ours can develop the amazing (and sometimes downright outrageous) colors that they do? Tropical inhabitants—especially fish and birds—come to mind, as well as various butterflies come immediately to mind, and I’ve found myself wondering if they could be any more flamboyant if someone had given hallucinogenic drugs to a group of kids (of any age), provided them with an array of magic markers and paints and fluorescent lighting and turned them loose to invent the wildest creatures they could think of. 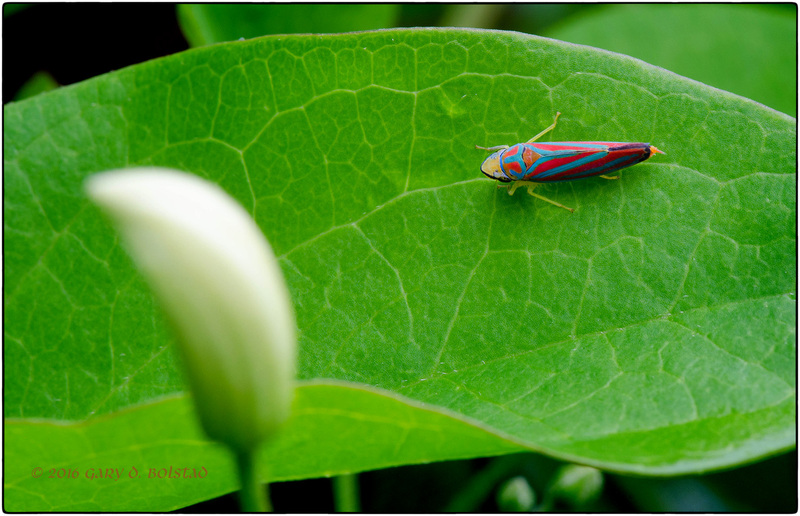 Ever since I saw my first one as a boy in Michigan, I have been drawn to the minuscule (average 8 mm or 1/3 inch) red-banded leafhopper (Graphocephala coccinea), which could quite conceivably be the creation of someone whose mind and imagination have been considerably altered and enhanced, respectively. While I was looking for yesterday’s katydid again, with not much hope of finding it, a small butterfly caught my eye, and then another, and while I was following them around to where I thought they had landed on our sweet autumn clematis (Clematis paniculata), which climbs up and all over our mailbox, this little fellow whizzed up and landed on a nearby leaf, whereupon I abandoned all pursuit of the butterflies and started cautiously (and gleefully) stalking my new prey. I was able to get within comfortable macro distance and the breeze was calm, and—after its third move—it became comfortable enough with me nearby that it was apparently content to dismiss me as a potential threat. Welcome to Krikit Arts! I'm a veterinarian; photographer; finger-style guitarist, composer, instructor, and singer/songwriter; fisherman; and fly-tyer. Please enjoy--and please respect my full rights to all photos on this Website! This entry was posted in Portraits and tagged Flora, Flowers, Insects, Macro, Omaha, Summer. Bookmark the permalink. 19 Responses to Kids on drugs? Seeing new things is always exciting. I was pretty awed when I first saw this sharpshooter. Once I saw my first I started seeing them all over our yard. I’ve found them to be pretty tolerant also. They are much more common than many would think. They always make me smile! Candy-stripped leafhoppers really do stand out. Leafhoppers in general are great, but this one has the color. They really are amazingly agile, too, both jumping and flying. They’re an inspiration! What amazing markings and colour. I guess the blue pattern surprised me the most. Reds, oranges, yellows, greens seem almost common (when you come across that shade of blue in an insect). That really is a surprising blue and, except in butterflies and moths, I agree that it’s a relatively rare sight. Certain flowers and insects seem to beg to be turned into jewelry, and this is one. A cloisonné brooch comes to mind. The blue and red combination, and the chevron pattern, also brings to mind the old Venetian trade beads. Perhaps there were similar insects around them that provided inspiration. Very possible, Linda. I love the idea of a brooch! I’ve seen some wonderful ones made in the image of dragonflies and other insects, but never one of these. That could be spectacular! Gorgeous! I’ve never seen one of these, and with those colors I doubt I’d miss it if it crossed my path! It does look like some sort of yummy candy. I’ve been showing the photo to friends in our area, and many of them have never noticed them either. They are so very small that they are actually really easy to miss. But with your eye for the wee folk, you’d have a great chance of spotting one if it happened to cross your path, I’m sure. That’s the most unusual insect I’ve ever seen! Wow, that’s saying a lot–there are some really fantastic ones out there. They certainly are unusual, and they have a very special place in my critter esteem. They are very hard to catch with a camera, though, as they are so tiny, and they can jump (or, rather, hop) or fly off without a moment’s notice and without any apparent provocation. But sometimes they stay in place for just long enough, thank goodness! I guess that one is a ham! Or maybe a Hollywood hopeful! What a beauty, those colours are almost unnatural! As you suggest, it would require a liberal dose of psilocybin for a human to imagine a colour scheme like that for a bug. Is it poisonous? Not in the least, as far as I know. I’ve had several land on me, and though I’ve taken care not to antagonize them, since they’re so small and flitty, I’ve never had one try to chow down on me. They should be able to, if they wished, as they have piercing and sucking mouth parts for plant juices, but I believe they’re perfectly harmless for us. The striking coloration may, however, be a warning to potential predators that they taste really nasty! I was thinking along the lines of being poisonous to predators. Usually anything that is as deliberately gaudy as this little guy can pack a nasty punch to the unwary!